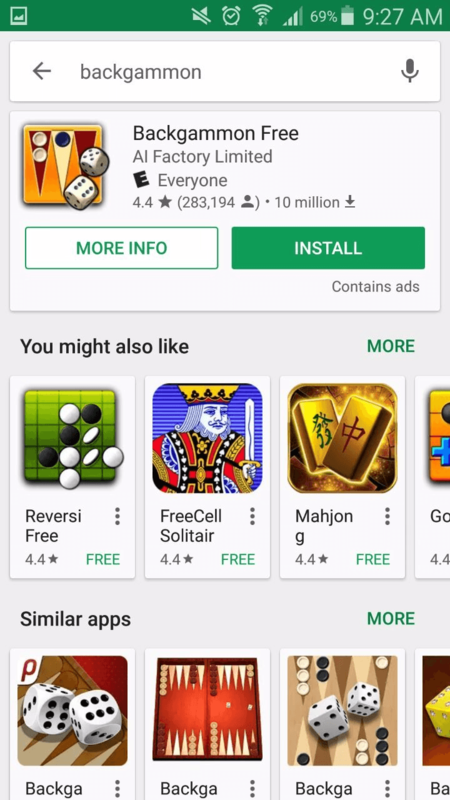 As of last month, Google started to experiment with the layout of search results in its Google Play store. Numerous sources, including 9to5 Android and the Tech Portal, reported the experimental rollout of new features such as app “cards”, which allow you to swipe through app pages one by one rather than seeing them in a list, and a new search suggestions display. But the new feature that we at yellowHead took most notice of was the addition of the “Install” button directly in search results for the top apps of certain queries. This change is also accompanied by a new layout of search results. The first case was noticed when we searched for “backgammon”. 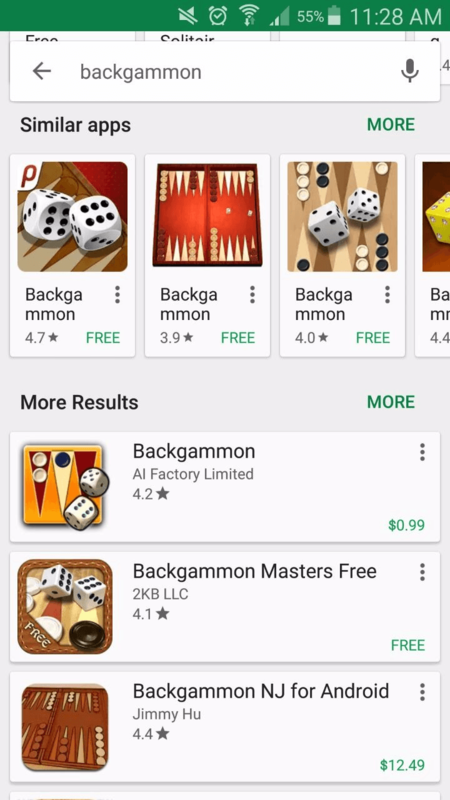 The results below show that the game Backgammon Free, which right now ranks #1 for the keyword “backgammon”, takes significant real-estate at the top of the search results page with a big Install button. Below it are apps “You might also like” and “Similar apps” in a horizontal layout, followed by the traditional vertical list by keyword ranking below the fold. We then went on and searched for “slots”. Expecting a similar layout, we actually got the traditional vertical list of apps by order of keyword ranking. However, when we searched for “Slotomania”, a more specific slots brand, we got the same layout as we did for our “backgammon” search. This drives our hypothesis that the new layout may apply to branded searches, rather than broad searches. But there is some contradicting evidence to this. 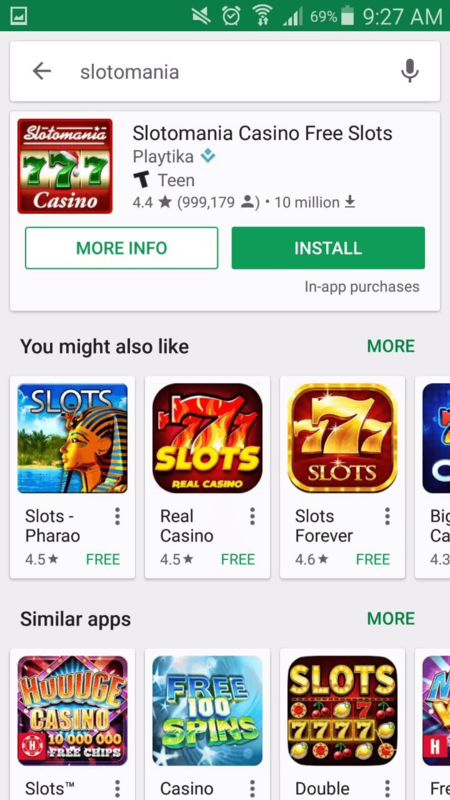 On a different Android device, we ran the same search for “slots” and did get the new layout, this time with two of the top slots apps at the top of the page with the install button. In this case, as well as in the case of backgammon, the new experimental algorithm may be picking up the words as a brand… Or Google is simply experimenting with different layouts for different varieties of searches. Given that this feature is being tested and not fully rolled out, there may still be errors in the new search algorithm. 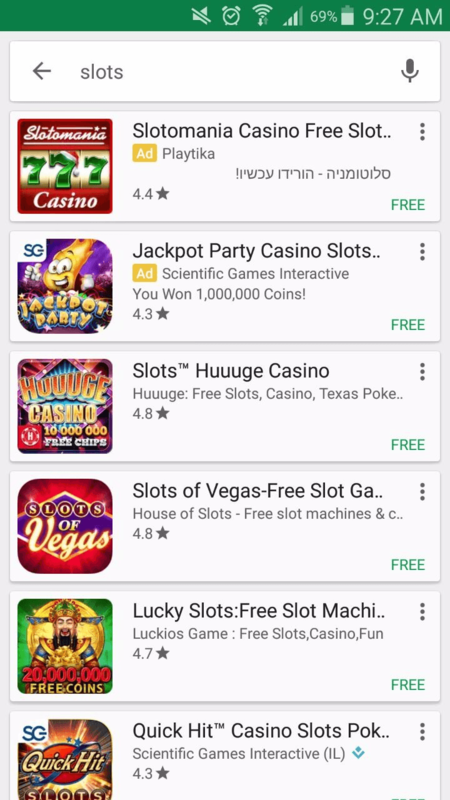 Search results for “slots” on Device 1. 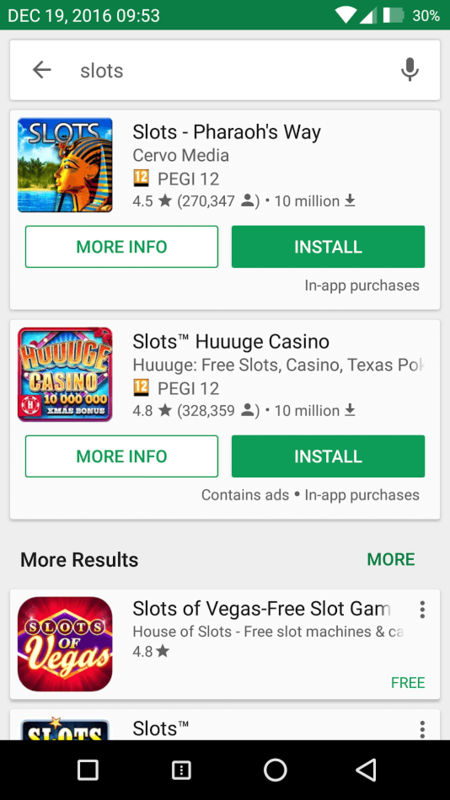 Search results for “slots” on Device 2. To validate our branded search hypothesis further, we looked into a completely different category and searched for “taxi”. 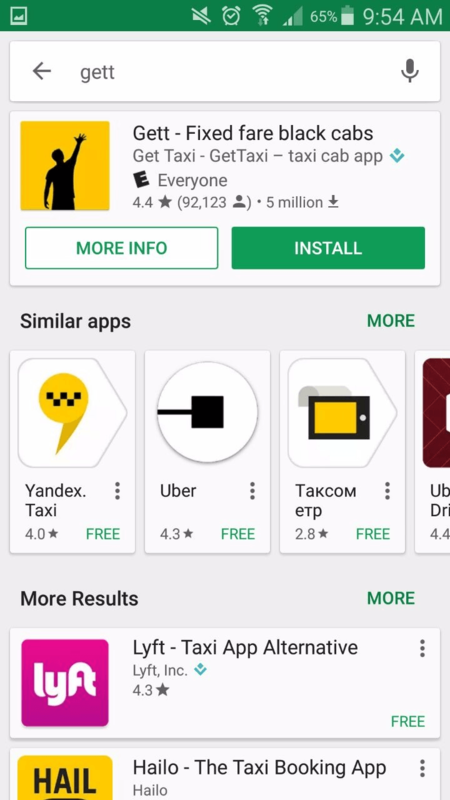 What’s interesting here is that, while we did not see a large listing of the top ranked app with an Install button, we did get horizontal search results broken into “Popular Results”, “Transportation”, and “Taxi Games” with no vertical list at all. 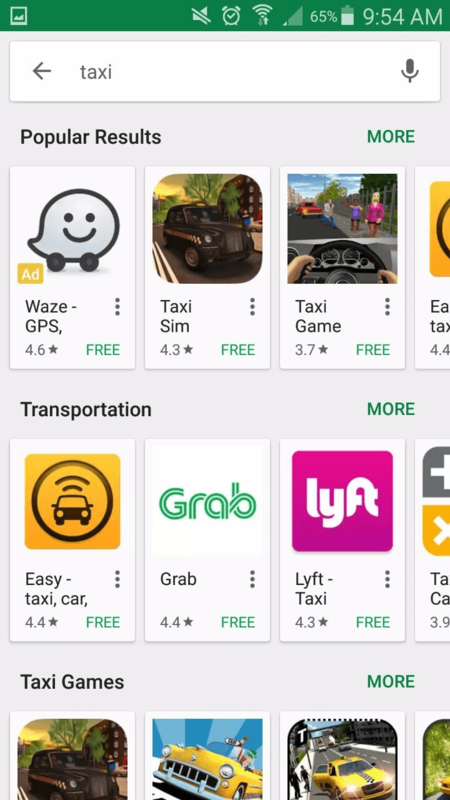 When we searched for the brand, “Gett” on the same device, we did see the large listing at the top for Gett with an Install button followed by “Similar apps” and a vertical list by keyword ranking. The layout of search results seems to be completely experimental at this stage, varying across different queries and categories for different users. However, the fact that the top search result for branded searches shows up first, with can’t-miss real estate and an Install button, is extremely important. 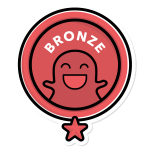 This can significantly increase conversion for your brand’s app. Make sure the branding within the app’s listing is clear and properly targeted to ensure that you claim this position in the new search results. We will keep an eye on this development as it unfolds and will report any new findings in our blog. For any questions or inquiries, feel free to contact us!